Why ambient? A math teaching style that’s whole and all encompassing, with themes that repeat many times through the years, is most likely to be effective and successful. Today’s post will focus on a bit of backstory from the Grade 1 section of the Math By Hand binder before starting our year with form drawing and the Common Core Geometry Standards. The 3 Rs. They do play a big role in Grade 1, as ‘Riting, Reading, and ‘Rithmetic. Letters and numbers, as the building blocks, though they may already be known on some level, are now introduced formally, while imparting relationships and deeper, foundational meanings. The letters can be taught one by one. No rush, since they will be read and written lifelong, and if the first association is positive, it will remain so. First, a story is chosen that fits the letter. For example, a King could be selected to represent the letter K, as it lends itself beautifully to the form. A regal arm outstretched, one foot forward, a flowing robe, and crowned head make the K. It’s drawn large on the page as the K and the King, surrounded by other elements and/or details from the story. If this context is used, letter formation will flow, with the story holding the letter in place, unencumbered by reversals or mistakes. Reading is then taught through writing, as familiar parts of the story are copied into books and illustrated. 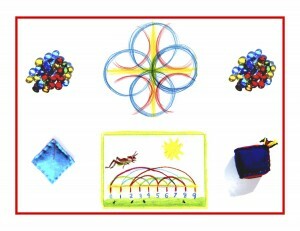 Numbers can be introduced similarly to the letters; the numbers 1-12 could be illustrated with specific stories. “East of the Sun and West of the Moon” for example, might convey the idea of one-ness. The numbers, like the letters, could be drawn in special books, large, with the story illustrated on a facing page. The special quality of each number might also be demonstrated by a form drawing, such as a triangle representing 3, a square, 4, a hexagon, 6, etc. In this way, story and art helps impart meaning to the abstract numbers, so that an interest in and a love for them will naturally follow. 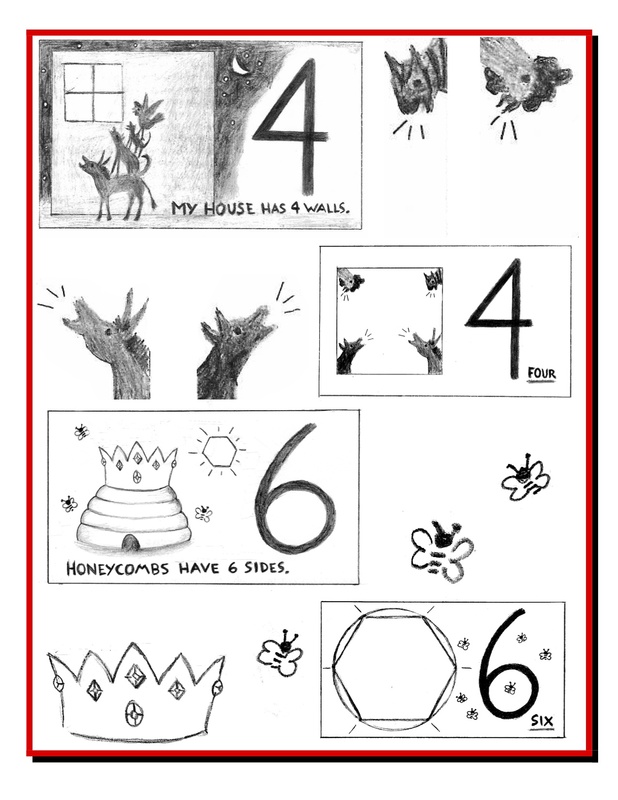 (See below for examples of the 4 and 6 with story and geometry illustrations.) 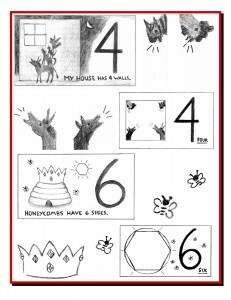 After the numbers 1-12 are learned in this way, and the nature and differences of the cardinal and ordinal numbers experienced, counting can be taught in lively, natural partnership with movement, recitation, and singing. Rhythmic recitation and movement are excellent aids to learning counting and the times tables. Since math (or arithmetic) is rooted in the rhythmic system, it blends well with music, rhythmic speech, and movement. An excellent way to learn the 3s, for example, is walking in a circle, stamping and clapping every 3rd number while quietly whispering and stepping the in-between ones. Jaunty hats and pouches add to the fun, as stories are acted out and the character of each process is seen. Pouches are filled with counting stones, shells, or gems, and calculation has begun. Can 7-year-olds learn to knit? Yes! After making wooden needles with dowels and beads, they learn simple stitches through imaginative verses and stories, knit a small rectangle, fold and sew it, and stuff it with wool. A sitting cat! There’s pride of workmanship and improved eye-hand coordination, along with brain development and stimulation. All of the arts subjects offer many such benefits, while bringing endless enjoyment and enthusiasm. The time spent playing games, in gym class and recess, also reaps many rewards along with being just plain fun. Hoping this sneak preview has whetted your appetite for more Grade 1. And remember that true knowledge ensues in an environment dedicated to imaginative, creative knowing, where student and teacher alike surrender to the ensuing of that knowledge as a worthy goal. See you tomorrow for form drawing and Common Core geometry!